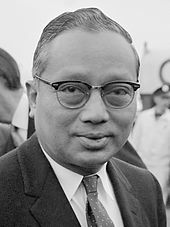 Myanmar (English pronunciation below; Burmese: [mjəmà]),[nb 1] officially the Republic of the Union of Myanmar and also known as Burma, is a country in Southeast Asia. 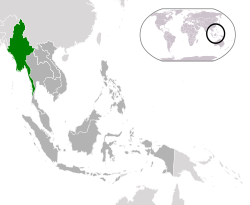 Myanmar is bordered by India and Bangladesh to its west, Thailand and Laos to its east and China to its north and northeast. 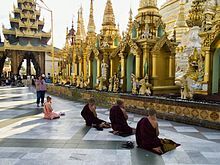 Myanmar is the largest of the mainland Southeast Asian states.To its south, about one third of Myanmar's total perimeter of 5,876 km (3,651 mi) forms an uninterrupted coastline of 1,930 km (1,200 mi) along the Bay of Bengal and the Andaman Sea. 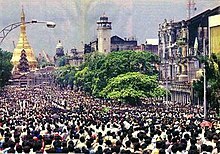 The country's 2014 census counted the population to be 51 million people. As of 2017, the population is about 54 million. 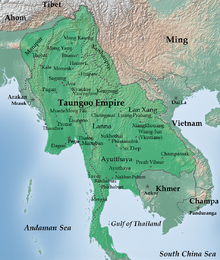 Myanmar is 676,578 square kilometres (261,228 square miles) in size. 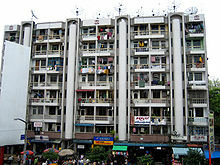 Its capital city is Naypyidaw, and its largest city and former capital is Yangon (Rangoon). 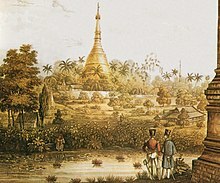 Myanmar has been a member of the Association of Southeast Asian Nations (ASEAN) since 1997. Ma (older sister) - a female (Miss. ), older than the speaker or it can be a female personal name (e.g., Ma La Win). These words ( U,Ko, Maung) are used for title, but somtimes it can be part of their names. 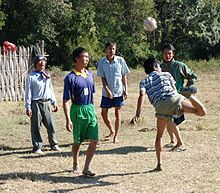 For example, a male name Lin Aung, might be known as Ko Lin Aung as a teenager, Maung Lin Aung as a young, and U Lin Aung as a middle age man. Myanmar continues to perform badly in the global Environmental Performance Index (EPI) with an overall ranking of 153 out of 180 countries in 2016; among the worst in the South Asian region, only ahead of Bangladesh and Afghanistan. The EPI was established in 2001 by the World Economic Forum as a global gauge to measure how well individual countries perform in implementing the United Nations' Sustainable Development Goals. 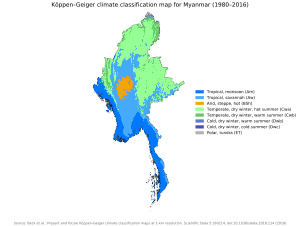 The environmental areas where Myanmar performs worst (ie. highest ranking) are air quality (174), health impacts of environmental issues (143) and biodiversity and habitat (142). 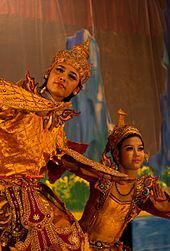 Myanmar performs best (ie. lowest ranking) in environmental impacts of fisheries (21), but with declining fish stocks. Despite several issues, Myanmar also ranks 64 and scores very good (ie. a high percentage of 93.73%) in environmental effects of the agricultural industry because of an excellent management of the nitrogen cycle. 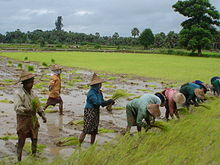 Myanmar is one of the most highly exposed countries to climate change; this exposure poses a number of social, political, economic and foreign policy challenges to the country. 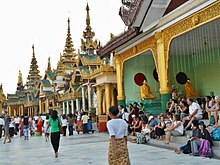 Myanmar is ethnically diverse. The government recognizes 135 distinct ethnic groups. 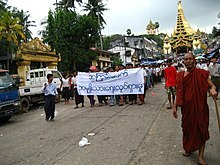 There are at least 108 different ethnolinguistic groups in Myanmar, consisting mainly of distinct Tibeto-Burman peoples, but with sizable populations of Tai–Kadai, Hmong–Mien, and Austroasiatic (Mon–Khmer) peoples. 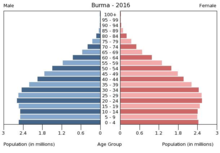 ^ Burma/Myanmar: What Everyone needs to Know. This page was last edited on 24 April 2019, at 16:10 (UTC).